On December 3 and 4, the Sarah Orne Jewett House participated in the third annual Home for the Holidays celebration in downtown South Berwick, Maine, with a free open house and holiday shop. With candles flickering in the windows and wreaths decorating the exterior, the Jewett House welcomed 205 visitors. All enjoyed viewing reproductions of Jewett family Christmas cards and reading passages from Jewett’s letters including references to Christmas presents, holiday shopping in Boston, and a very special stocking filled with treasures from a friend. 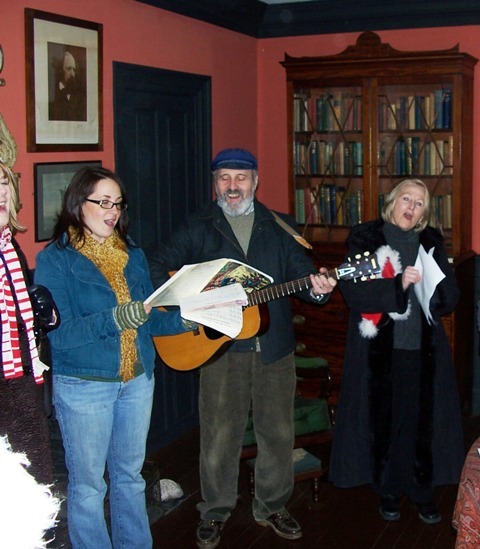 One of the highlights of the evening was a visit from a group of carolers who performed several songs in the library.